The principal sarcophagus of the chapel. It had been known for some time that this area held antique tombs, since the hill was being extensively quarried to provide building materials for a fast-expanding modern Alexandria. Much had already been destroyed, though certain archaeologists of the late 19th century had been able to record other tombs that were subsequently to disappear. Thanks to their reports we still have descriptions and drawing's which show that the complex that can be visited today was part of a vast necropolis, traces of which must still exist under the foundations of the neighbouring buildings. By the turn of the century, however, sensibilities were changing in Alexandria, and a greater appreciation of the city's past was beginning to emerge. The foundation in 1892 of the Greco—Roman Museum was both an important example of and factor in this development, and the institution's first director, the very able and active Giuseppe Botti, the first director of the Greco—Roman Museum in Alexandria, set about the systematic excavation of the new discovery at Kom el Shoqafa. It was to be a major undertaking, and one that was not truly completed until 1941 when Alan Rowe, a later director of the Museum, pumped out the ground water filling the lowest level and recorded what he found. This problem of water was known in antiquity, and it is no accident that the complex was dug into one of Alexandria's few elevations. The descent into Hypogeum is by a spiral staircase cut in antiquity round a huge circular shaft. This served several functions. It was by means of this well that the bodies of the deceased could be lowered to their final resting place and it also provided a source of light and ventilation for the tomb. As we shall see, while the dead may have been sealed into their graves, the tomb itself was not kept closed. The living could and did have access much as today one might visit a cemetery to pay respects to someone who has passed on. During the actual digging of the complex, the shaft also served as a passage through which the excavated stone could be extracted. Just over three quarters of the way down the stairs there is a small square opening in the outer wall. Through this can be seen a massive cistern, which was used to collect drainage water from the surface. The heavy rains that Alexandria can experience during winter posed another threat of flooding and guttering was installed to channel this water away from the tomb and into the cistern. From here it could be taken to serve in rites associated with the funerary cult. At some point in antiquity, however, this cistern lost its original function, and a doorway was cut through from the central shaft. The space was then used for additional burials, and it was discovered the mummified body of a woman bearing some fragments of gold jewellery in one of the sarcophagi. The stairs open out into what has traditionally been known as the Vestibule, a brief passage between the central shaft and the Rotunda. Slight traces of alabaster flooring can still be seen, evidence that this was no pauper's grave. On either side are small semi-circular niches, each of which houses a bench and is vaulted in the form of a cockle shell. This circular chamber originally led only to the left, into the triclinium, and straight ahead, down to the principal tomb. Other sets of tombs were cut into the walls as and when more space was required. In the centre there is another shaft surrounded by six pillars joined by a low parapet. This secondary shaft reaches down to the third underground level, now submerged, but the purpose of this lower passageway remains somewhat of a mystery. It was at the bottom of this shaft that a team of German archaeologists in 1900 discovered five portrait statues, two of which were on display in the Greco—Roman Museum. One is of a man wearing a sort of crown, on the front of which there is an emblem incised with seven lines. This sign has allowed him to be identified as a priest of Serapis, the greatest of all the gods at Alexandria. The other is a white marble portrait of the Empress Julia Longina, with a foolish face and aquiline nose. Her abundant hair is braided and tied at the back of her skull but spills out in a great wreath of tight curls that frames her face from temple to temple. Such a style is typical of the Flavian era (AD 69 to AD 96). She was the wife of Domitian, who reigned from AD 81 until AD 96, when he was assassinated by the Praetorian Guard at the behest of the Senate. His authoritarian rule had been so hated that his nephews were dropped from the line of succession in favour of the aged Nerva. Because of this it is highly unlikely that the head of his wife would have been publicly exhibited after his death but just how it came to be lying at the bottom of the Rotunda is not known. To the left, the Rotunda opens into a large chamber, 8.5 metres wide and 9 metres deep. This is the triclinium or dining room which was used for meals in honour of the dead and is no different from rooms used for the same purpose and at much the same period at Pompeii. Here the builders had the sensible idea of raising the central section of the ceiling by a metre, thus giving a greater feeling of spaciousness. Without this, the atmosphere would be positively claustrophobic. Nevertheless, the general impression of solidity is further emphasized by the stout pillars at each corner of the bed platform. As with every feature of these catacombs, they have been hewn from the rock itself nothing is truly built here. At about head-height on the front two pillars there is a small cavity into which torches would have been fixed providing extra lighting for the diners. These diners would have reclined, three on each section of the platform, around a central table. The figure nine, the number of the Muses, was considered as an auspicious number for dinner though several others could have been accommodated on the outer parts of the bed towards the wall. Given the limited number that could fit, it is reasonable to say that it was only the immediate family of the deceased who gathered for these commemorative feasts. Aside from the fortieth day after death, the departed's birthday was marked plus specific ceremonial days dictated by the Greek and Roman calendars. Leaving the dining room and passing through the Rotunda, on the left a staircase leads down to the principal tomb, the bizarre and striking centerpiece of Kom el Shoqafa. As the steps descend, they split to bypass a sort of protuberance known as the Prompter's Box. This is another entry to the third underground level. Standing in front of this we are faced with a veritable little funerary temple complete with antechamber—the pronaos—set before the inner sanctum, the naos. The effect of this being a separate chapel is all the more real as the constructors detached it on all four sides from the rock and, depending on the water level, one can walk all the way round. It was, in fact, by way of this back passage that bodies were placed in the rock-cut sarcophagi. The facade of the antechamber is very much in the Egyptian style. Two columns and two pilasters support a curved pediment bearing a solar disc and, beneath a denticulated cornice, a frieze with two representations of the falcon, Horus, looking inwards at the spread wings of another solar disc, flanked by two cobras. The columns and pilasters are similarly decorated, with a pattern of papyrus leaves on the bases and a mixture of lotus, papyrus and acanthus buds on the capitals. Stepping inside, however, the styles begin to mix. The two niches, one on either side, are in the form of rectangular, pharaonic doorways but the figures they frame are more complex. While both, the woman to the left and the man to the right are in a hieratic pose—left leg forward, arms pressed firmly to the sides as if manoeuvring a wheelbarrow—the rendering of the heads is quite individualised, in the Greco—Roman tradition. The man's features and tousled hair are reminiscent of a statue exhibited in the Museum while the braided hair tied in a bun of the female figure is typical of Roman women from the end of the first century AD. The confusion of style continues on either side of the doorway into the central chamber. Here we have the bearded serpents, representing Agathodamon, who was a benevolent Greco—Roman divinity. They hold a caduceus, the symbol of Hermes Psychopompus, who guided the souls of the dead to the hereafter, and a thyrsus, the symbol of Dionysus, who also had connections with life after death. All seemingly consistent, and yet they wear on their heads the pharaonic double crown of Upper and Lower Egypt. Above each is a shield bearing the head of Medusa, the Gorgon, who had the terrifying ability literally to petrify all who looked her in the eyes. This emblem is found on numerous Alexandrian sarcophagi, some of which can be seen in the garden of Kom el Shoqafa, and its purpose was to discourage grave robbers, turning to stone anyone who penetrated the burial chamber with evil intentions. Risking the wrath of Medusa, we can now step into the funeral chamber, the resting place of the initiators of this complex. 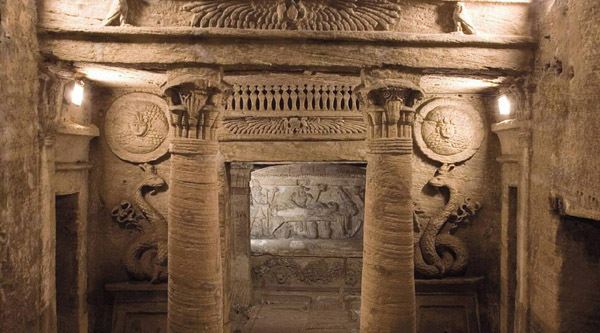 There are three sarcophagi tightly packed into this tiny chapel, and the walls above each are busy with high relief carvings of Egyptian religious scenes. The principal sarcophagus, following a plan repeated in other necropoli, is that which lies transversely and opposite to the entrance; and on its front are wreaths and garlands plus the heads of Medusa, to the left, and Silenus, Dionysus' bawdy attendant, to the right. Most significant, though, is the figure of a reclining woman. This has often been interpreted as an image of the deceased and thus the same woman who stands to the left of the pronaos. Above, on the wall of the recess, a mummified Osiris lies on a lion-shaped bed under which are three Canopic jars. These held the innards of the eviscerated dead. From left to right there is the dog-headed Duamutef for the stomach, the anthropoid Amset for the liver and Qebehsenuf, the falcon, which held the intestines. There should be four such jars—one more for the lungs. The fourth does turn up in another scene but the initial mistake is intriguing. Behind the bed, the dog-headed god of the dead and embalming, Anubis, is in attendance. At either end there is the ugly ibis, Thoth, god of writing, knowledge and much besides, and Horus, a figure of authority with his sceptre and double crown of all Egypt. All three appear to be holding a pot, possibly full of embalming unguents. The left- and right-hand sarcophagi do not have any potentially identifying figure but are decorated with garlands and dangling bunches of grapes, one of the symbols of Dionysus. In the centre is an ox skull and, on either side, a Medusa. Above, the central scenes are the same in both recesses: the bull god Apis stands on a pedestal and is being presented with a large necklace by a figure dressed as a pharaoh. To the rear of Apis, we see a goddess, possibly Isis, holding the Feather of Truth in her hand and spreading her wings in a gesture of protection. The lateral scenes, however, are slightly different. The right-hand recess, left-hand wall, shows a bare-chested man (pharaoh-emperor) with a nemes headdress holding the Feather of Truth towards a mummified Osiris, whose cartonnage is decorated with separate little patterns. Between them stands an altar. The opposite panel depicts two mummies holding staffs and separated, once again, by an altar. One of them seems to have a monkey's face and thus might represent Hapi, the fourth of the Canopic divinities and the one that is missing from under the bed of Osiris. Above the altar is another cartouche of illegible hieroglyphs. The left-hand recess, right-hand wall, shows the pharaoh-emperor, with a hem hem on top of his nerves, and a mummified Osiris. The left-hand lateral panel has two mummies facing each other. One, wearing a heavy wig, is unidentified while the other is easily recognisable as Qebehsenuf, the falcon-headed Canopic god. On leaving this chamber one can see two rather formidable figures carved on either side of the doorway. These are both representations of Anubis. To the right, he is dressed as a Roman legionary wearing a short kilt, leaning on his lance and holding a shield with his right hand. Though at first sight he may appear bare-chested, he is in fact wearing a breast-plate. Across this is strung a belt from which a sword hangs down behind the hips. The second figure bears the atef crown with ram's horns on his dog head and also has the accoutrements of a Roman soldier: breast-plate, kilt, lance. 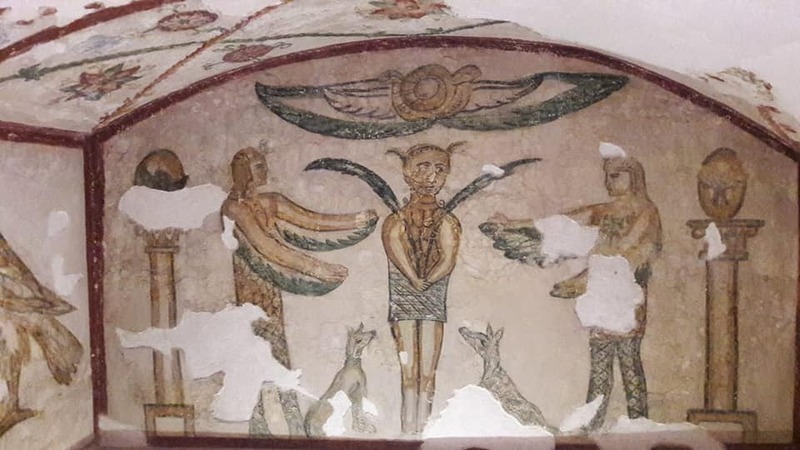 This time, however, only the torso is human, the legs being replaced by a long, twisting serpents tail which is reminiscent of the Agathodxmons on the other side of this wall. They stand guard, looking towards the door, protecting the tomb from intruders.